WTF?!? 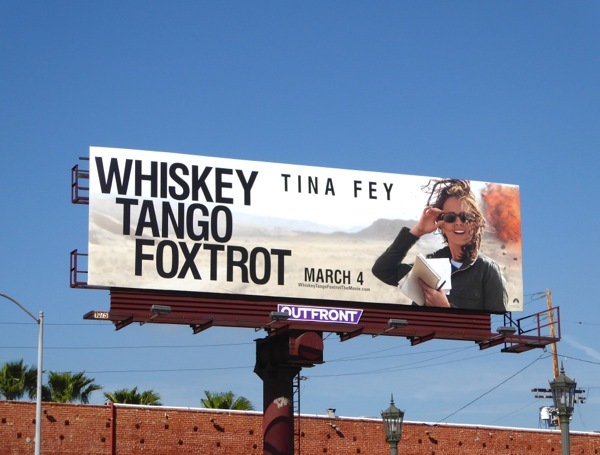 They say war is hell, but it looks like Tina Fey is trying to find the comedy in conflict with her new movie, Whiskey Tango Foxtrot. 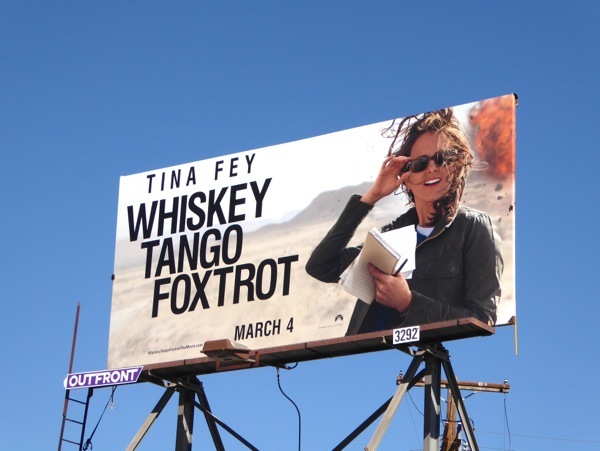 Set around 2003, she plays a TV news writer whose life is shaken up when she is dispatched for a daring new assignment in the out-of-control war zone of Kabul, Afghanistan. 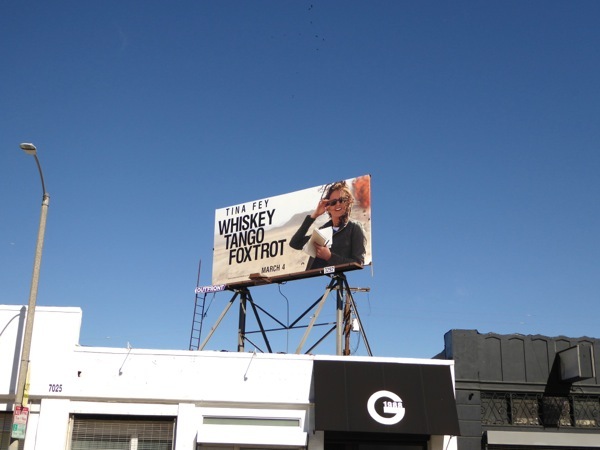 Based on the 2011 memoir by Chicago Tribune's Kim Barker about her time in Afghanistan and Pakistan, Fey's 'Kim Baker' is at first a fish-out-of-water as the new on-camera war correspondent for her media outlet, until she starts to find her feet by day and night with the help of a fellow journalist on the ground, played by Margot Robbie. 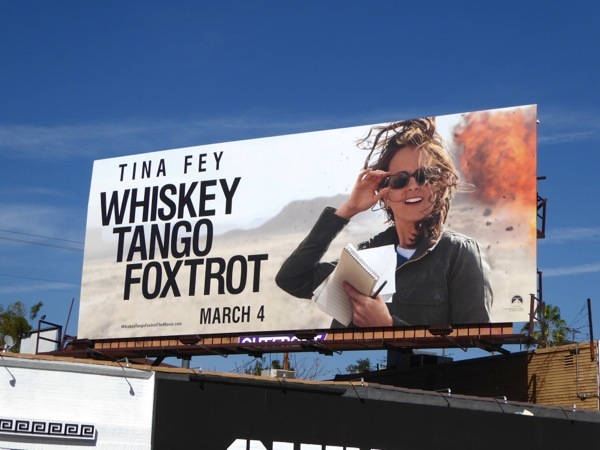 This windswept ad creative for Whiskey Tango Foxtrot certainly captures the idea of a reporter being right there in the action on the frontline with the explosion in the background. 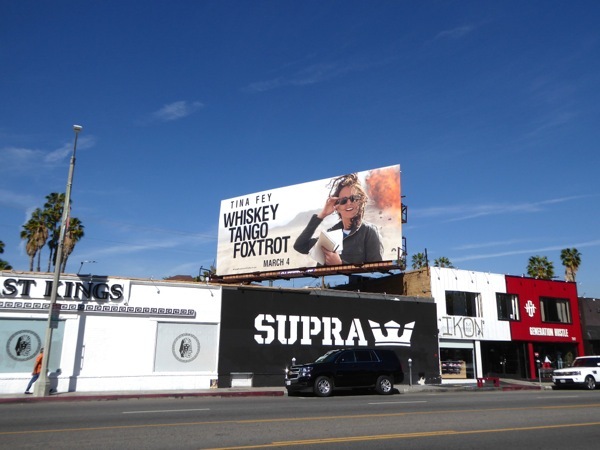 The smaller billboard ad for the movie was first spotted along Melrose Avenue on February 10, whilst a bigger version photographed further west along Melrose Avenue and another larger landscape bulletin was snapped along Santa Monica Boulevard on February 19, 2016. 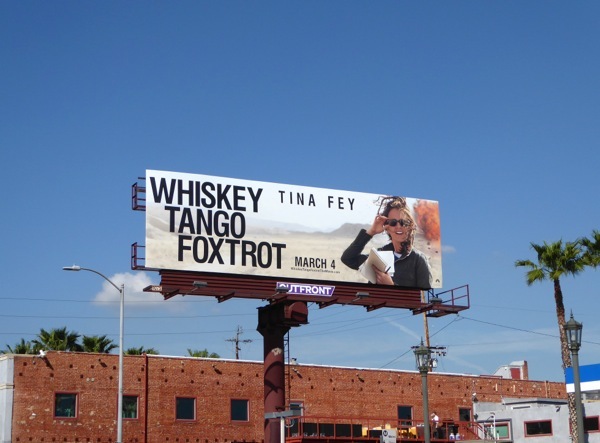 If you're a fan of the funny lady, be sure to also check Tina Fey out in these Sisters movie billboards, these Golden Globe Awards billboards and this 30 Rock billboard. Will you be fox-trotting along to the cinema this weekend for a few laughs, or would you prefer the explosive action of London Has Fallen, or animated hijinks of Disney's Zootopia?